Updated 2018-11-07 with a few clarifications from Kathy Giori on the Mozilla IoT team. 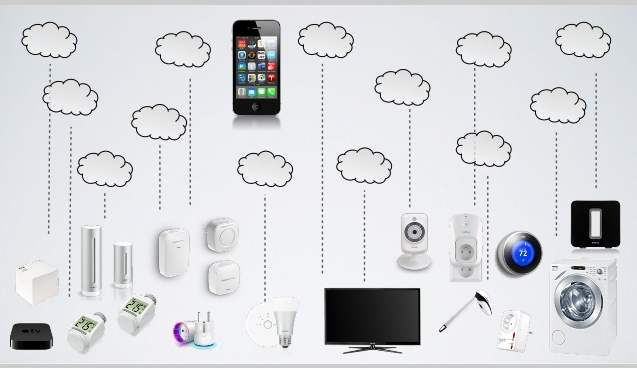 The Internet-of-Things landscape is a mess. Everybody is trying to build the dominating IoT castle in the cloud, collecting (and almost never giving back) as much user data as possible; user wishes and needs be damned. It’s no surprise that consumer IoT has not seen a lot of “production” (as opposed to play-around-with) uptake so far. So when I first heard some years ago that Mozilla had an IoT project, I was excited. More so than any other leading tech organization, Mozilla stands for the open web, no lock-in, privacy, user advocacy and the like. Unfortunately, it has taken them many changes of plans and management to have “something” in IoT. But now it’s worth taking a look. Here is what I learned so far about the approach they are taking. Remember the first time you saw a URL? (In my case, that was 25 years ago this month, during a visit at JPL of all places! And I was blown away!) You would have this slightly odd-looking text string starting with http://, and if you typed it into this new piece of software called a web browser, it would go on the internet, as far as it needed to go, and fetch a text document, or a picture, and show it to you right in front of you. And then you could click on text with a blue underline, and it would fetch some other document, possibly from a computer in a completely different part of the globe. It was magic: the simplicity of it, and how easily you could weave information togther that was held on far-away computers, without having to ask anybody for permission. None of the power of URLs from back then has gone away since (although many have been trying very hard to stuff the open web back into corporate-controlled walled gardens), and we have found many novel uses since. For example, not only can we point to documents with URLs, but also to companies (e.g. my company), or people (e.g. me) and entire protocol stacks have been built for those additional uses of URLs. The big idea behind the Mozilla IoT project (and the W3C IoT project), is to also use URLs to point to IoT devices, and use standard web protocols to interact with them. If the traditional web is any indication, this can open up unprecendented innovation and opportunity in IoT as well. Basically nobody (historically and currently) does this so far, and if you think back to the slide above, it’s quite clear why: If your goal as an IoT vendor is to dominate and control your users and the entire industry, the last thing you want is that anybody can connect to your products as easily as putting a URL into a web page. So the intriguing premise behind this project is to blow IoT wide open, leave the locked-down cloud castles behind, and let 1000 flowers bloom. Just like the Web 25 years ago. It seems this project is worth spending some time with, right? a power meter (how much power is currently consumed through this power outlet?). A thing may have properties, which may be read or written. An action may be performed on a thing. A thing may raise an event. That sounds all very familiar? Yep, it’s the basic API of certain kinds of “objects” (like Java Beans) applied to IoT devices. Check, that will work. This is all very straightforward and elegant. The only difference now is that we use HTTP for REST-ful “query” operations and Web sockets for notifications. The details are documented here, and quite straightforward, so no need to discuss them here. More interesting is to ask: how do we know what properties an IoT device has, which actions it can perform, or which events it might raise? Easy: let the device tell us! And the simplest way would be to simply describe this in a JSON file that can be requested via HTTP from the device. Which is what they have done. So if you want to interact with an unknown device at a certain URL, you first retrieve that JSON file from that URL, which tells you all you need to know, and now you can interact with the device. Or software that interprets that file for you can interact with the device on your behalf. Note the lose coupling and the self-description: to interact with the device, I don’t need to interact with anybody else. Certainly not the manufacturer website, read complicated data sheets, or install networking device drivers. Note that I don’t need to know anything about the manufacturer at all! This is very nice. This is the reason why I titled this post “… (not quite) web native“. For me, the web is HTML, not JSON, and there is nothing in the spec that speaks about HTML. This could be fixed easily, however: simply add to the spec that when accessing any of the URLs defined in the spec with a regular browser, a human-readable version of the JSON needs to be displayed. And then fix inconsistencies between expected user experience and locations of JSON in the namespace (like that the root of the device URL needs to show the status of the device, not the metadata). How do I keep track which device is which? Say I repaint the house, and as part of this project, I temporarily remove all light bulbs. How do I put the right bulb back into the right socket? If I run a “gateway” app as they envision, but my individual IoT devices all speak this protocol natively, how exactly does the situation stay consistent if changes can be made from all sorts of places? In the extreme case, if a fan (speaking this protocol) has been made a part of the HVAC system, but if its speed is changed directly (by talking to its URL), will the HVAC blow up? Perhaps the system needs some kind of exclusive access reservation, so only the HVAC software would be allowed to interact with it? To be sure, this is not intended as criticism but as a feedback to a project that is still quite early. The whole point of release early and often! I have some smaller feedback, too, which I will file as issues on Github has they request. Next step: see what it would take to make my Pool Timer speak this protocol, and my attic fan, both of which are controlled by a Raspberry Pi each. 3 Responses to "When things go (not quite) web native — thoughts on Mozilla IoT"